19 May 2015, at 12:00a.m. Report on an investigation by the CGIAR Livestock and Fish research program aimed at improving pig feeding on Ugandan smallholdings by Brian Kawuma for the International Livestock Research Institute (ILRI). Pig production in Uganda is on the rise. The number of pigs in the country stood at 3.2 million in 2011 (based on a livestock census) from about 200,000 30 years ago. A rise in the country’s population and incomes has triggered an upsurge in pork consumption. The per-capita pork consumption of Uganda was 3.4kg per person per annum in 2011, the highest in the East Africa region. Most of the pork consumed in the country is supplied by smallholder producers in over one million households, with women playing a central role in pig farming. These figures, however, disguise challenges in the sector including diseases and parasites, unreliable markets, inadequate extension services and most importantly, poor quality and unavailability of pig feeds. 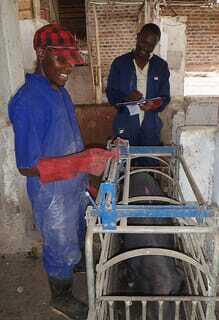 A 2013 value chain assessment conducted by the International Livestock Research Institute (ILRI), as part of the International Fund for Agricultural Development (IFAD)-funded Smallholder Pig Value Chain Development project, showed that irrespective of the pig system practised, feed accounts for 60 to 80 per cent of the total cost of production. 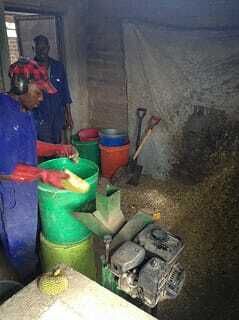 Farmers frequently use crop residues, green fodder and kitchen leftovers to reduce feeding costs and in many cases, they supplement these with commercial or home-mixed concentrates. Worse still, many pig farmers operate independently and are not organised into collective associations which lowers their bargaining power when purchasing feeds and when selling live animals. Additionally, the currently unregulated feed processing sector has given rise to a number of unscrupulous feed traders who produce substandard feed and use either extraneous bulking material (such as sawdust) or sell infested feed at prohibitive prices. 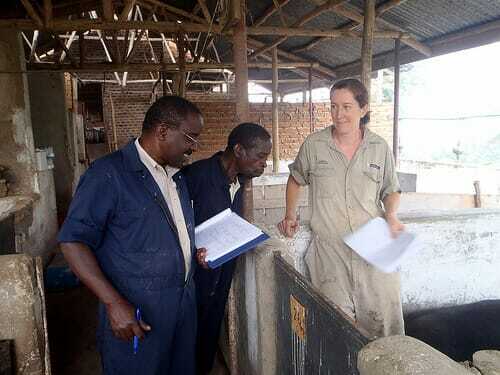 As part of a research intervention aimed to alleviate the feed crunch for smallholder pig producers, the University of Guelph’s Department of Population Medicine, in partnership with ILRI, started a feed trial in Kamuzinda Farm in Uganda’s Masaka District. Led by Natalie Carter, a PhD candidate and an ILRI/University Guelph joint appointee, the six-month study tested novel pig diets using locally available crop residues and feedstuffs to determine the difference (if any) in the average daily gain in weight of pigs fed on a silage-based ration, or a ration using local feedstuffs and if these differ from the average daily gain of pigs fed commercial feed. the volume of water consumed per day by local and crossbreed pigs. Uganda has two main rain seasons (March to June) and (September to December) during which food crops are grown and fodder for livestock is more readily available. For the rest of the year, farmers’ reliance on locally available fodder and crop residue for their pigs leaves them vulnerable. To cater for the seasonal variation, Ms Carter and the project team formulated two diets, a diet based on locally available resources and a silage-based diet. The local diet was based on fresh locally available ingredients (forages, fruit) and purchased feeds (fish, cottonseed, maize bran) developed with nutrient requirements suitable for crossbred pigs (implying that the local breeds would be fed higher nutrient levels than they require). These ingredients are readily available during the rainy/wet seasons. The second diet was based on ensiled sweet potato vines and tubers (ratio 70 per cent vines to 30 per cent tubers to reflect work done in Kenya by ILRI’s Ben Lukuyu with nutrient requirements suitable for crossbred pigs. The vines and tubers were purchased from the local growers in Masaka and Luwero districts. The two feed diets were then tested on 90 pigs, half of which were the local pig breed and the other half, crossbreed pigs. Preliminary results revealed that though pigs fed on commercial feeds (off-the shelf, pre-packaged feed) performed better, there was considerable weight gain among the pigs fed on the locally formulated diets (local and silage diets). The feed trial further confirmed that low-cost balanced diets can be developed to meet the nutrient requirements of pigs on smallholder farms. The findings will help many Ugandan smallholder farmers who struggle with finding the right quantity and quality of feed for their pigs. This article was written by Brian Kawuma and was first published by the CGIAR global research partnership.